Also participating in the debate was Lars Grossmith, the Libertarian candidate running on a platform of abolishing government involvement in schools, all business activity, and advocating for increased gun ownership as a way to reduce crime, and Peace and Freedom Party candidate Miriam Clark, whose professorial history lesson provided the audience with a background on how our current government and political policies came to be. Busby wasted no time in jabbing at her Republican opponent, chiding him for representing the interests of lobbyist and big business instead of the people who elected him. Throughout the night, she repeatedly brought up the highly controversial Congressional Cigar Association, the lobbying front established by Bilbray that hosts get-togethers for members of Congress and their staffers to mingle with the lobbyists who fund it. “We’re not talking about a revenue problem. We have a spending problem,” Bilbray said. However, Bilbray did not enumerate what cuts he would like to see, and how much it would save, and did not present any plan to pay for them. Busby, not surprisingly, took a different stance: “Children brought here by immigrants did not commit a crime.” She says she supports the DREAM Act, which provides a path to legal status for those young people who attend a four year college or university for at least two years, or serve two years in the military. “We must take a comprehensive approach to immigration reform,” Busby said, for which she was loudly booed by the Bilbray supporters in the audience. She also reminded the audience that Bilbray was a paid lobbyist to the tune of over $300,000 for the anti-immigration organization FAIR, which has been deemed as an anti-immigrant “hate group” by the Southern Poverty Law Center. And while Bilbray does not support the concept of comprehensive reform, he does tout the implementation of an E-Verify system to aid employers in identifying those workers here legally. On the subject of campaign finance reform, Bilbray expressed “concern” about the recent Supreme Court ruling on the “Citizens United” case, which for the first time allows corporate interests to put their direct financial support behind a candidate or political cause without requiring the source of the funds to be identified. Davy, the moderator, then turned to the topic of jobs and the economy, saying that the stimulus bill did not deliver many jobs. “There is a clear decision for voters to make. Mrs. Busby wants Washington to have tax money more than she wants San Diegans to have jobs,” Bilbray jabbed. Mr. Bilbray “talks a lot about jobs and spending, but he voted against small business tax cuts, and he voted against greater access to loans,” Busby countered. “We must respect individual and personal rights. People should be able to serve in the military and live with who they want,” she continued. “I respect the Second Amendment,” Busby told the audience. “But we must have certain restrictions. There should be no concealed weapons allowed in school zones. And there’s no reason for us to allow assault weapons on our streets.” The Founding Fathers, Busby pointed out, did not have assault weapons whose sole purpose is to kill many people in a short amount of time in mind when they wrote the Second Amendment. 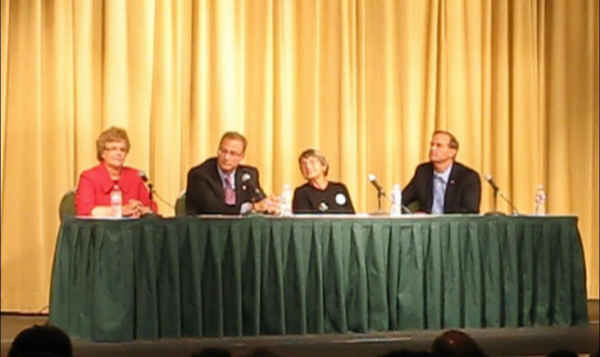 Busby repeatedly reminded the audience of San Diego County’s position to become a key player in the race to develop clean energy, and her desire to promote San Diego as the hub for clean tech/bio tech development, while pointing to the Koch brothers, owners of the largest privately owned oil company in the country, who have thrown their support behind Bilbray. “The goal is to have everyone have access to affordable, quality health care in this country. And we’ve taken the first step toward that goal.” The health care bill is not perfect, Busby said, but it certainly points us in the right direction. It was a highly contentious evening that appeared to further entrench both sides behind their candidates. And the contrast between the two sides could not have been more clear, particularly at the mention of off-shore drilling in California, which the Republican partisans and Bilbray supporters cheered, and Busby and her supporters vehemently oppose. The debate served to settle very little. There was very little agreement between the two sides, and the contrasts could not have been more distinct. One thing was very apparent to those in attendance: Passions are running very high this election season, and there is a lot at stake for San Diego County and the United States a whole. I’m just going to do the right thing this November and write in the guy who I think is gonna straighten out this entire mess. ROSS. He’s the guy to get things movin’. Write in ROSS. responsible for our economic mess, the wars, the job loss, and the debt. Thanks for the article, Andy, and Frank, thanks for printing it. There were a bunch of things that bothered me about the event……not the debate itself, but the behavior of the crowd. It almost became a competition between the Busby supporters and the Bilbray supporters (and I think Busby had more people in the crowd). But the one thing that REALLY ticked me off was the right side of the theater (seriously, the Bilbray people were all sitting on the right side of the theater!) cheering the prospect of drilling for oil off the coast of California. I mean, are these people completely brain dead? Especially after what we just saw in the Gulf of Mexico? And what do they think would be accomplished by expanding drilling? The U.S. has 2% of the world’s oil reserves, but consumes 25% of the world’s oil. The only thing that would be accomplished would be to make the oil companies much richer! To make the Koch brothers the undisputed Monarchs of the U.S.! If Busby has any sense, she’ll put up TV ads of Bilbray advocating expanded offshore drilling for California. That’s how progressives win. Catch these people being themselves. The US currently consumes 1 billion barrels of oil every 50 days. If we don’t curtail that consumption pattern with substitutes soon, global production decline rates will do it for us. If that happens, get ready for more wars and a global financial collapse. It can happen. We all better get out the vote. My biggest regret from the whole debate on a personal level is that I don’t have a proper video camera, and the camera I was using to record the debate ran out of memory. Thus, I only caught the first three minutes or so (just the opening statements of the candidates). It would have been SO GREAT to have on film these people wildly cheering the concept of offshore drilling in California. It was a moment of the debate that really struck me. These people truly believe that “energy independence” means getting all of our oil from local sources, not understanding that it is a complete impossibility. To them, math and science is a complete myth. By the way, Steve: I would suggest that you send that suggestion to the Busby campaign. Hopefully someone there will have that footage and be able to take advantage of it. They’re so wrapped up in the campaign itself that little ideas like that get passed over. So you might want to remind them. Andy, wouldn’t it be great if the OB Rag had both a video camera and a new point-n-shoot camera? Newer Article: So … you think that dogs can think?